This beautiful graphic novel tells the story of South London’s great north wood. Remnants of the wood can be found in the names and places of Norwood, Sydenham, Forest Hill, Honor Oak Park, Crystal Palace, Gipsy Hill and others. Using a local fox to guide us from prehistory to today, The Great North Wood shows how important the forest was to the development of South London and celebrates its continuity to today. On the way we learn some excellent facts. I was intrigued to find out that Pear Tree House block of flats in SE19 was built to be “a control centre in the event of a nuclear attack on London”, and the book even includes a floorplan of the reinforced concrete basement. Sharp modern realities exist alongside ancient magic in this enchanting account. As so many of our regular customers head home from London Bridge to these areas, I am sure that they will recognise the depictions of bus stops and chicken shops. The gorgeous colour palette helps make this a book to return to again and again. Many South Londoners will be getting this for Christmas from me. Hopefully they aren’t reading this. This lovely letterpressed book features many local sights and spots which will be familiar to our customers. Local author Michael Shann has captured the sensory joy of Borough Market perfectly: “to weave through the waft of grilling beef/paella, mulled wine and cheese/to take it all in and still to keep moving/past the gawp of a monkfish”. How excellent to have the Market on the page just when it needs our support and appreciation the most – http://boroughmarket.org.uk/articles/borough-market-bounces-back. Lovely too to see the Redcross Garden immortalised here – we are fans of this tiny beautiful Bankside space (http://www.bost.org.uk/open-places/red-cross-garden/). This pocket sized special edition would make a lovely gift for anyone with links to London Bridge or Southwark, and a great memento of a visit. The beautiful illustrations by Kirsten Schmidt make it extra special. 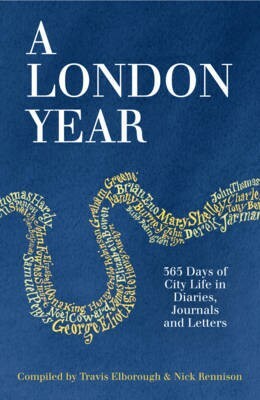 With the capital as the changing backdrop, this is a remarkable portrait of London penned by more than 200 diarists, including Samuel Pepys, Kenneth Williams, Alan Bennett, Mary Shelley, James Boswell, Virginia Woolf and George Gissing. From the 16th century to the 21st, it’s an eyewitness account of everyday life that takes in grisly deaths in Tudor times, Queen Victoria’s Golden Jubilee, anti-Vietnam war protests, World War I Zeppelin raids and Derek Jarman’s night out in Soho.